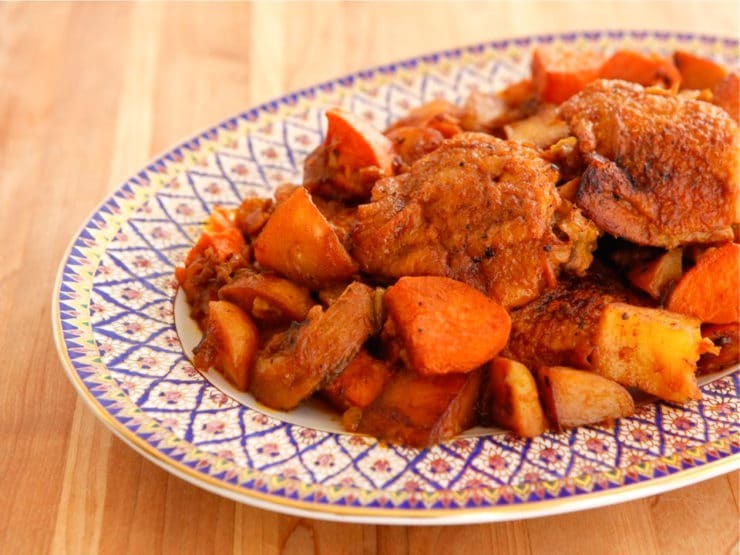 This Israeli Chicken Sofrito is inspired by a Sephardic family recipe from my sister-in-law. The term sofrito comes from the Spanish sofreir meaning “to fry lightly.” In Sephardic cuisine the name typically refers to a stew made from meat or poultry that is braised and cooked over low heat until only a small amount of liquid remains. The slow cooking process results in a very tender meat. This version of the dish likely earned the name sofrito because the majority of the ingredients are fried in oil before they are cooked. In Spanish and Italian cuisine, sofrito is a combination of aromatics that are often fried and used in a variety of savory dishes. The Italian version is made with parsley, onion, garlic and tomato lightly cooked in olive oil, while the Spanish version calls for paprika. The common thread between all versions of sofrito seems to be the oil. My sister-in-law’s version of this dish includes chicken consomme powder, a pareve powder that adds more savory chicken flavor to the dish. I love the flavor of chicken powder, but it’s loaded with sodium and many brands also contain MSG (the kind she uses is MSG-free, but it’s salty). I challenged myself to capture that ultra-savory flavor in a natural way without the use of chicken powder in order to cut down on the sodium. After experimenting, I found that once again the secret was in the schmaltz. By frying the chicken in olive oil and reserving the resulting chicken fat (schmaltz) at the bottom of the pot, I was able to fry the potatoes and onions in it, infusing them with all kinds of savory goodness. Using chicken broth for the braising liquid instead of water also helped to pump up the savory flavor. This recipe takes a bit of prep work, but once it’s all in the pot you can rest easy… the cooking will take care of itself. It’s perfect as a Shabbat dinner or a Sunday supper. My favorite part of this dish is the addition of an orange yam/sweet potato and lightly caramelized onions, two sweet flavors which compliment the spices and add depth to this ultra-savory dish. My stepdaughter adores the browned potatoes, which soak up the spiced chicken broth at the end of cooking. This is serious comfort food, a one-pot meal that satisfies. Do you have your own version of sofrito? 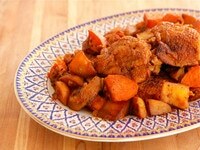 Israeli-style Chicken Sofrito, braised in broth and paired with russet and sweet potatoes and Sephardic Israeli spices. Kosher. Prepare the chicken thighs by sprinkling them with salt (lightly if it’s kosher chicken), then generously with black pepper. In a heavy pot with a lid (I prefer an enameled Dutch oven), heat olive oil over medium high heat till hot but not smoking. Oil should coat the entire bottom of the pot. Place 4 of the chicken thighs into the pan, skin side down, and cook undisturbed for about 7-8 minutes till the skin is dark golden brown (careful, it may splatter a bit!). 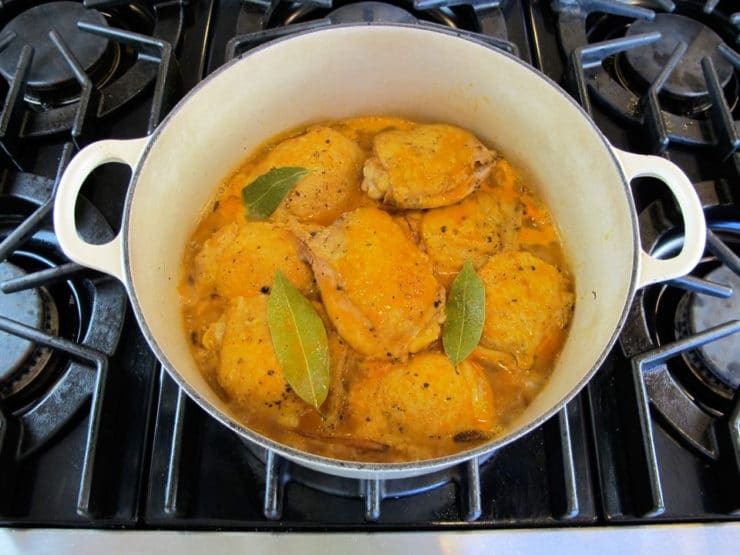 Do not move the chicken during the initial cooking process; the skin will initially stick to the bottom of the pot, then will loosen as it browns. If the oil begins to smoke a lot, lower the heat a bit and continue to cook. When the skin is brown and crispy, turn and cook for an additional 3-4 minutes till brown. 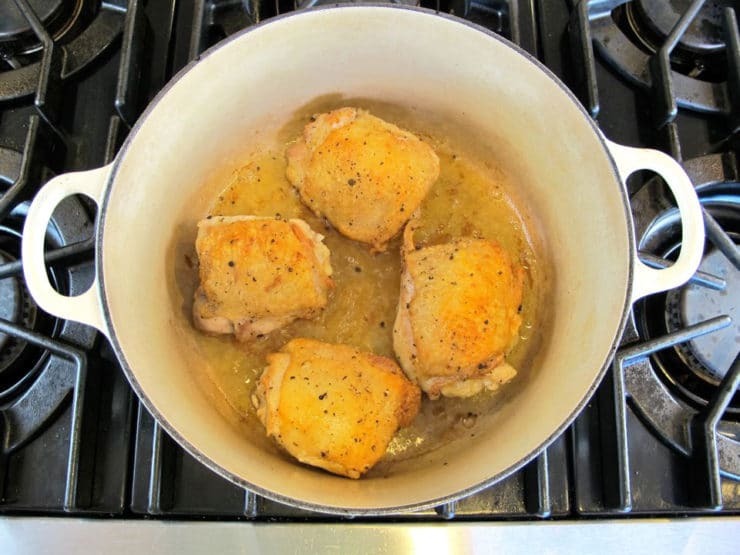 Remove chicken from pan with a slotted spatula and set aside. Repeat instructions for the remaining 4 pieces of chicken. Remove chicken from pan and reserve. You should now have plenty of cooking oil/schmaltz in the bottom of your pot. Fry the potato chunks for about 8 minutes, stirring gently 2-3 times during cooking, till potatoes are browned and crisp on the outside. You may need to do this in batches to ensure that the pot is not crowded for even browning. They should be semi-cooked and golden, but not overly soft. Raise heat if needed to make sure they brown evenly on all sides. Remove potatoes from the pot with a slotted spatula and reserve. 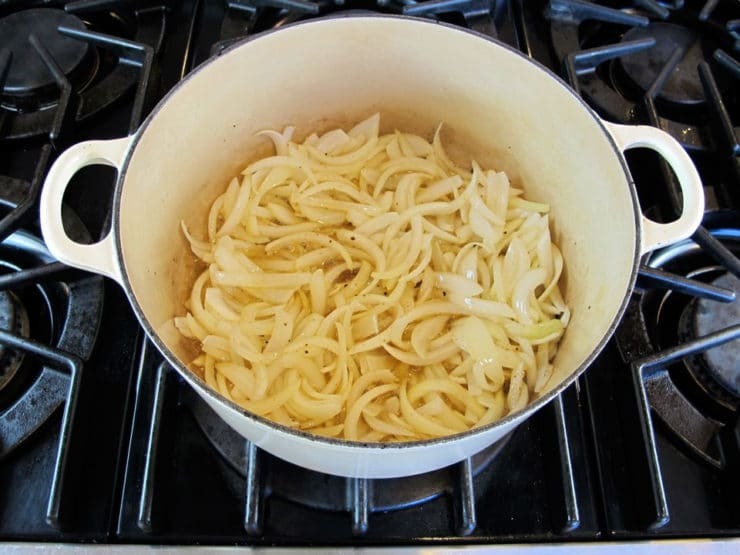 Add sliced onions and ¼ tsp of salt to the oil, stir to coat. Cover the pot and reduce heat to medium. Let the onions cook covered for about 10 minutes. 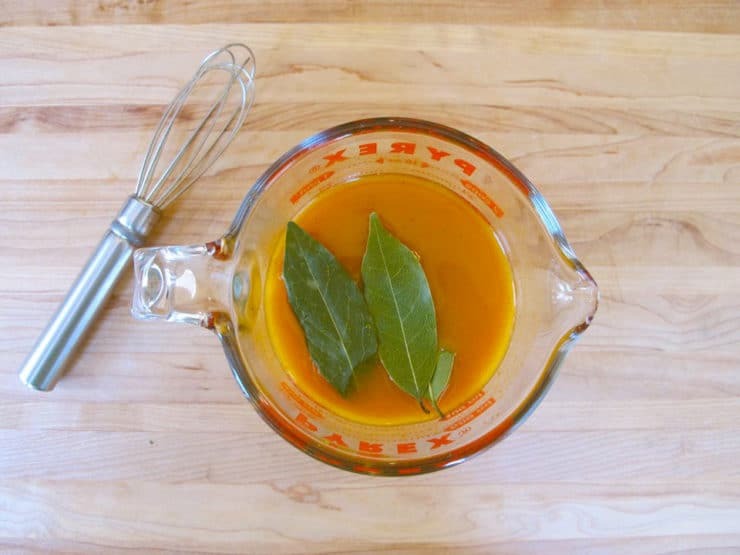 While the onions are cooking covered in the pot, whisk together the chicken stock, paprika, turmeric, garlic powder and bay leaves to create your cooking liquid. Set aside. Uncover the pot and continue to cook the onions over medium high heat, continuing to stir till the onions soften and begin to caramelize. Scrape up any brown bits from the bottom of the pot as you stir. The longer you cook the onions, the more they will caramelize. At this point, you can drain off the excess fat and schmaltz if you wish to cut calories, or you can keep it in the dish to add flavor. Add chicken and cooking liquid to the pot with the onions and bring to a simmer. Cover, reduce heat to medium low, and cook for about 60 minutes till the chicken is very tender (you can cook it even longer for a more tender result if you wish). Add the browned potatoes back to the pot and toss to coat with sauce. 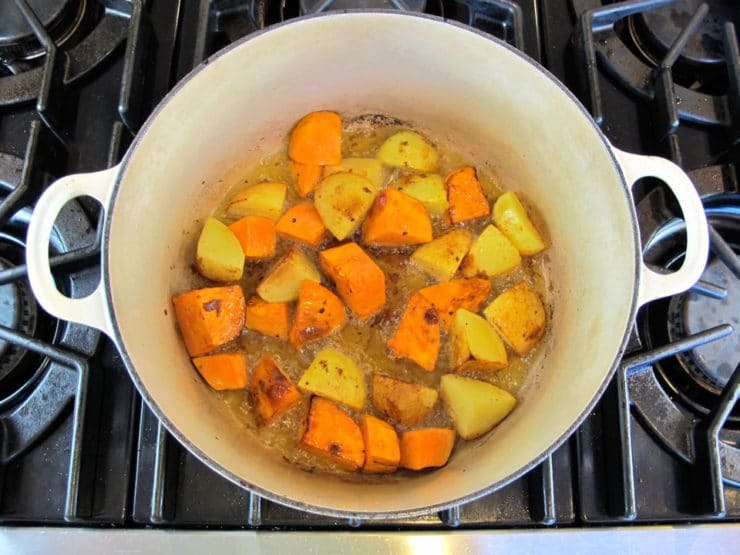 Raise heat to medium and simmer, uncovered, for an additional 15 minutes or until cooking liquid has reduced and potatoes are tender and soak up some of the cooking liquid. Adjust salt and pepper to taste. Serve sofrito and sauce on a platter in the center of the table. Enjoy! Would this would in a crock pot? This is my favorite recipe and I want to make it during the day while I’m out. I haven’t tried it, it would probably work but the lead-up steps require frying in the pan prior to the slow cook. I love this recipe. It take a little bit of time with all the cutting and chopping; but it is well worth it. It is SOOOOOOOOOOO delicious. I’ve made this recipe a few times and it’s perfect! My Israeli sister in law made something very similar with the juice of two oranges. We loved it! How can I use your recipe, which I’ve mastered, and get that citrus taste. Hi Amy! Glad you like this recipe. Without tasting your sister-in-law’s recipe it would be hard to know how to capture the citrus flavor she had. Will she share her recipe with you? I want to try to make this for a Seder meal. Have you ever tried putting it in the oven after browning all the ingredients? do you have a suggestion on temp and cooking time? Thanks! Hi Olga! I have not, but I think it will work as long as you cover it tightly. If I were trying it I would probably start at 350 degrees F and let it cook for an hour, then add the potatoes. Keep an eye on liquid level when you add the potatoes to make sure it’s not drying out, you want them to soak up the sauce. I made this for a church dinner with the theme of “what would the three wise men have eaten for their meals if they were traveling now” and it was a big hit. I used boneless chicken breasts and thighs but had a bag of chicken fat in my freezer which I used. This recipe is a definite keeper. I also made the Israeli Salad with Avocado and Mint and all my kitchen helpers asked for this recipe too. Thank you so much. Your website is a real treasure. I did exactly this recipe, but added some pre coocked (tinned) Chick peas to make it more “israeli style” and add some fiber & protein, since I did only use two chicken tighs and did not have sweet potatoes available. According to my three picky eaters it tasted delicious. Thanks Tori for sharing this recipe. I’m in the middle of making this recipe, and I realize I only have canned chicken broth as opposed to chicken stock. Does it make a big difference if you use one over the other? I made this for dinner tonight. it ended up being a more of a stew with a lot of liquid remaining. The flavors were insanely good. I mean, really, really delicious. This is a keeper. Hi Tori, thanks for yet another wonderful recipe! I wanted to do something new and different for dinner tonight, so I decided on this sofrito. It turned out delicious! My family really enjoyed it! Great Talia! I’m so please people are enjoying this recipe, it’s a family favorite of ours. Made this for my family and it was a hit. Very easy to make and so delicious. Looking forward to trying out the Chai Noodle Kugel next!! Thank you for the fantasic website. I have a question about the paprika, I have 3 kinds on hand: Sweet,Smoked,Imported Hungarian. Which would you suggest to be used in this dish? While I am not of your faith, my family has loved every dish I have prepared from your site and my almost grown son loves all your mocktail recipes! I have started looking for the Kosher hescher on product because I simply find them to be of higher quality. Again, thanks for that tip. Hi Stephanie, you should use sweet or Hungarian paprika. So happy you’re enjoying the site! Hi Tori, I’m wondering if anyone’s ever tried this with skinless chicken? Yikes! Yes, I did, still delicious! 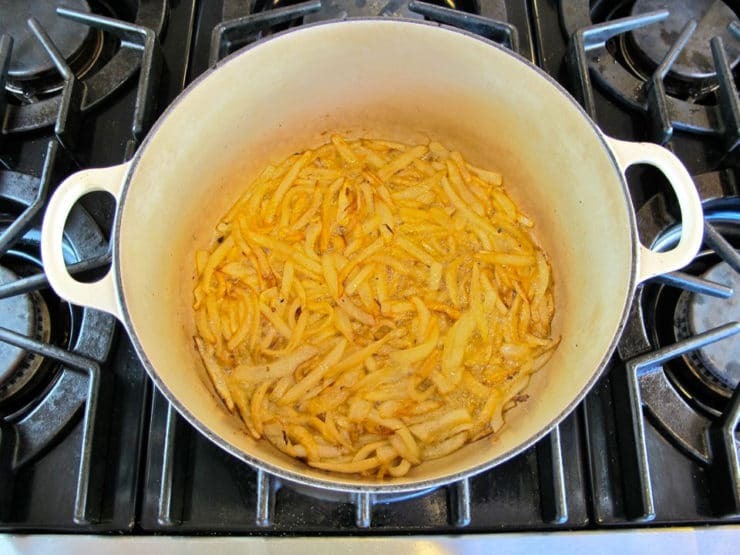 Just compensate for the missing schmaltz by adding extra oil to fry the onions and potatoes. I also cooked my onions separately in a cast iron skillet to save time. I was thinking of substituting carrots for the regular potatoes and using orange juice in lieu of the broth. Did you brown the carrots first? I just want to say thank you for that lovely recipe. 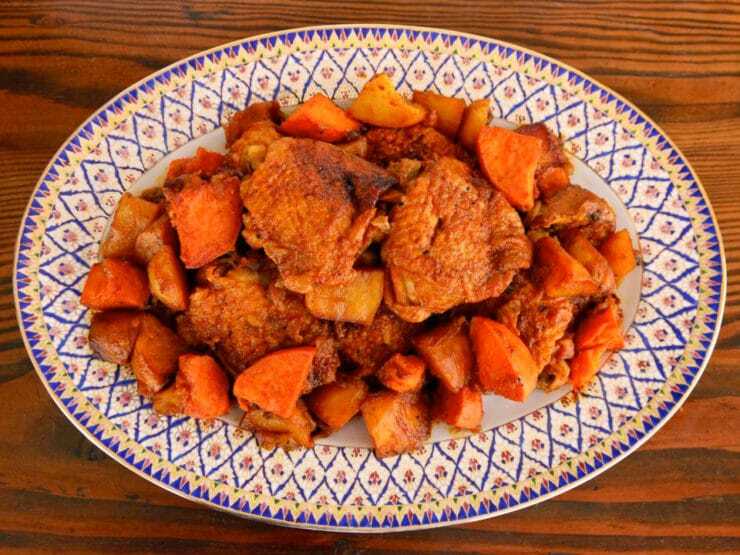 I am a Sephardic too and at home we never had this kind of dish neither or stews. My grand ma use to cook all the time G d rest her soul more than my mom but when I immigrated I learned a lot more than being over seas. I cook all the time as my grand ma did for my family. 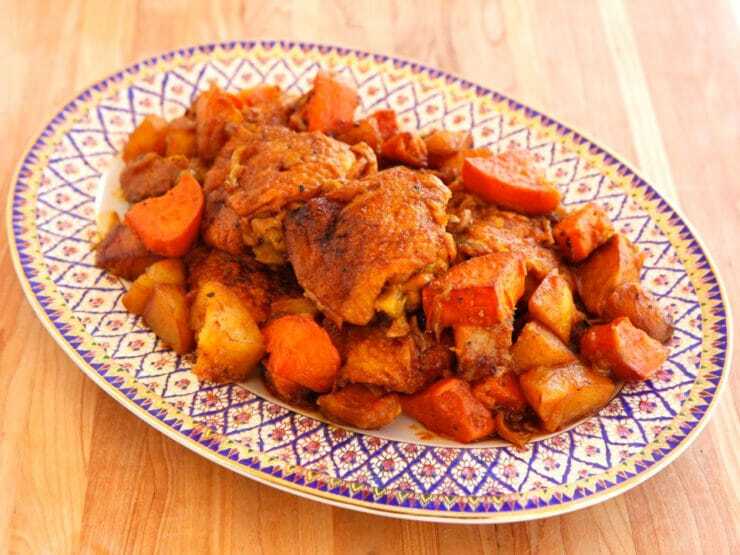 My Grandmother made this as I was growing up, but I did not know it was a Sephardic recipe! I now know where our Dafina & Sofrito came from! A touch of this and a touch of that make it your own personal recipe! I do have some questions. Surprise surprise. You put very few potatoes in for 8 people. My family are big eaters – my fault. Big servings. But no fat children. I would obviously use more potatoes and yummy chicken. How would I increase the rest of the ingredients? What’s a Dutch oven? I’m originally British and I’m not sure what it actually is. What is a slow cooker! really good for and what can it do that other pots can’t do? I love chicken. Roasted. Curried. Soup. You name it I love it. Hi Judy, in this case I would just double the recipe and make in two separate pots, otherwise the pot will be overcrowded and it won’t cook as it should. The leftovers are terrific. A Dutch oven is simply a large, heavy pot with a lid, usually made of cast iron. It’s great for braising and stews. Any large, heavy pot with thick walls and a tight-fitting lid will work for this recipe. It looks excellent! You just gave me idea what to cook for weekends or if I catch time for week dinner! I am returning to my grandmother’s Sephardic cuisine. With the kids just back to school, this dish really is a delicious comfort-everyone cleaned their plates and went to bed happy with full tummies & requests for the leftovers for lunch tomorrow. Thank you for this recipe! You’re welcome Corinne, so happy your family enjoyed it! Tori, my sis and I made this tonight. It was my 2nd time (first time, I added too much liquid, so it was more soupy than anything else). Came out perfect, so good. 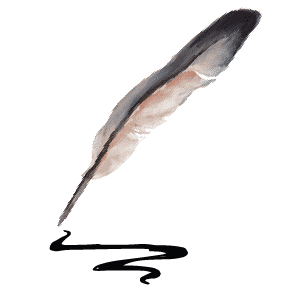 Thank you for your recipes — I love your site!! Great Rachel! Happy to hear you’re enjoying the recipes. Please help spread the word about the site! Hi Sherry! It will probably work well in the crock pot as long as you do all of the sautéing steps before putting the ingredients in. The only thing I’m not sure about is the liquid levels… crock pots can be tricky in that the “low” setting heat varies from cooker to cooker. If I were to test it I would start with the amount of stock listed in the recipe, cook it on low for about 8 hours, then add more if it appears dry towards the end of cooking. If it seems too liquidy and not reduced enough, you could up the heat to high for the last hour or so of cooking. It’s not an exact science. If you try it please let us know what worked for you! Made this tonight for dinner. My family put in top 5 dinners of all time. My super picky son even had 2 helpings. Thank you!!!!!! My husband is very anti eating chicken on the bone. Would this be worth making with boneless chicken thighs? I think u r awesome, btw. Thanks Lori, that is very kind of you! The trouble with boneless skinless chicken here is that a lot of the savory flavor comes from cooking the potatoes and onions in schmaltz, which accumulates from the skin of the chicken during the first saute. The bones also add a lot of savory flavor to the mix as it cooks. What I would do if I were you is cook it with bone-in, skin-on chicken, then remove the skin and bone prior to serving. It will be easy to remove the skin because you fry it crisp before cooking, so it should stay in one easy-to-remove piece. Also the meat will be very tender, so you should have no problem slicing it from the bone. If you try it let me know how you like it! I don’t think this is too much work as another stated…this is how food was supposed to taste AND ITS GREAT. My grandchildren (ages 6,7,10years old) love to help me cook and this is the perfect recipe for our family. We live in New Zealand and love chicken. Agreed Robs. It does require a little bit of effort, but the flavor is so worth it! That should be “chicken sofrito.” Automatic spell corrector strikes again. I made the chicken soffits this week and really enjoyed it! I found that I needed to cook thinks longer than the recommended times, so my stove probably cooks cooler than yours. I love carmelized onions, so I cooked mine for 30 minutes or so. The dish was flavorful and a really relaxing cook with lots of time to do other things in the kitchen (clean up, make salad, etc.). Oh, and I loved the sweet potato in it! Great dish! Great! So happy to hear that Karma. What do you think about adding golden raisins to this? Not a lot, just a scant handful. My mother baked her chicken, potato, onion with oil and a splash of vinegar, salt and pepper of course. A peasant type dish, but delicious!!!! it was not fried but baked until the potato was browned. In Spain, we call sofrito to frying onions, garlic,and tomatoes, although lot of people also add red peppers, and of course, the Olive oil!!! All I can say id Y*U*M*! Argentine sofrito (sautéed veggies) = onion, garlic, green peppers, tomatoes, cumin, hot sauce, cilantro, salt & pepper. Usually some strips of beef are added but you can use any meat. Does the chicken skin stay crispy or does it get soft when you add the broth? It looks crispy in the picture. It softens as it cooks in the sauce, but has more flavor because it is initially browned before cooking. looks great… too much work tho! I´ve got to try this. It looks great. Yes, the South American sofrito: onion, garlic and bell peppers, tomatoes, some jalapeño or Tabasco, salt and pepper, and cilantro at the end. I use that for lentils! Sofirito means sautéed in Spanish. sofrito, to Cubans, refers to lightly frying onion, garlic and peppers (with some spices) in oil before adding it into black beans or cooking with this mix. Here is the quintessential Cuban recipe: Make a Sofrito; then decide what you are going to cook. Italians too, make Sofritto; using the same ingredients, plus a little Pancetta; and sometimes, an anchovy or two. I like the veggie version @ Chipotles. In my Latin cooking class a sofrito was a sauce that we used..
Puerto Rican soffits. Comes in two colors yellow and green. We usually good with green. I have my own, this one´s good too ! Pinned this one. Thank you.